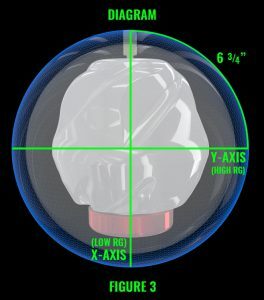 “Should I drill this ball pin up to give me some extra length, or pin down to give me an earlier roll?” A vast majority of bowlers today generally make this their primary decision when drilling a new bowling ball. If you’ve ever been in the pro shop business, you’ll hear it all the time. With so many changes to bowling ball technology over the last 30+ years, what do those changes in layouts really do to ball reaction? 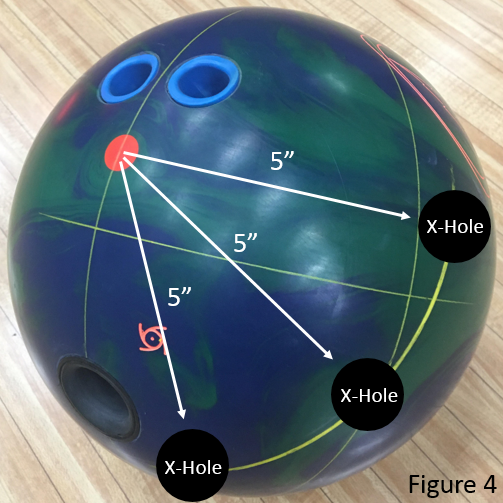 Bowling ball technology has evolved over time making some of our older theories not quite as relevant to today’s game. 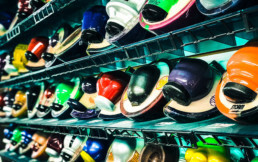 In order to understand what has changed, let’s take a step back in time and look at bowling ball technology in the early years of bowling. 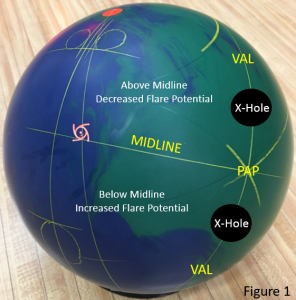 Early day bowling balls did not have heavy dynamic shapes to create large flare patterns. Take a look at Figure 1. The picture on the left is an example of what the inside of a majority of bowling balls looked like 30+ years ago. They consisted of a small slug at the top of the ball which the fingers and thumb would be drilled over to offset the weight lost from drilling. 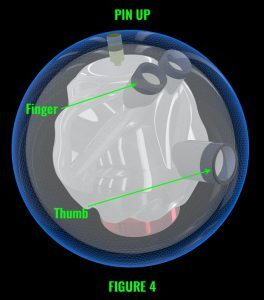 Since this was the primary shape causing imbalance, static weights such as finger and thumb weight were much more relevant to ball reaction. When drilling a ball pin up, it would generally have more finger weight. This caused the ball to get down the lane a bit further. When you drilled a ball pin down, it would generally have more thumb weight. This caused the ball to react a bit sooner. The static weights were much more influential because there was nothing else inside the ball for gravity to influence. Fast forward to today’s game. Take a look at Figure 1 again. 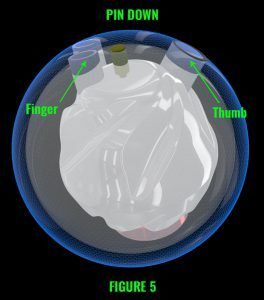 The picture on the right shows the inside of a modern day bowling ball. We now have large, dense, and dynamic shapes that dominate ball reaction. We can now create vastly different reactions using different drilling layouts. The laws of physics cannot be broken. Our main concern with the powerful cores of today’s game is the radius of gyration (RG) and differential (Diff). These two work together with other variables to create 3 distinct phases of ball motion as the ball travels down the lane. While there are other variables influencing these phases of ball motion, we are going to hold them constant for the time being and focus on this piece of the puzzle. Before we understand what the reaction differences between pin up and pin down layouts are, we need to know what is actually changing in the layout that causes the pin to be above the fingers compared to below the fingers. Take a look at Figure 2. It may look like a lot to take in at first, but it's a great illustration of the difference between pin up and pin down. 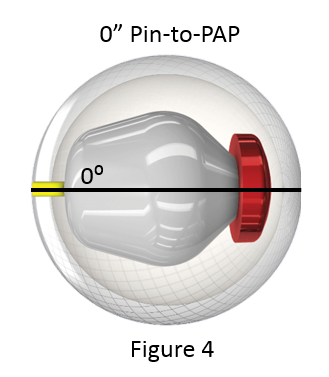 We can have two different balls with an identical Pin-to-PAP distance and MB-to-PAP distance, but one has the pin above the fingers the other has the pin below. The cause of the change is the final measurement in Storm's Pin Buffer Layout System, the pin buffer. Shorter pin buffers are going to raise the pin because they have to be closer to the VAL. 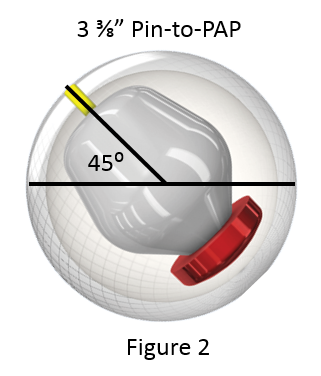 This is seen in the ball on the left in Figure 2. Longer pin buffers are going to lower the pin because they have to be further from the VAL. 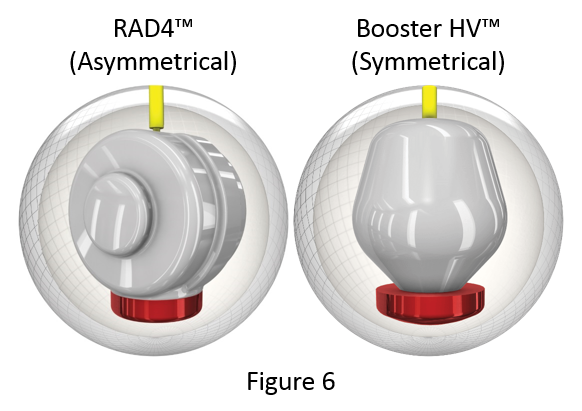 This is shown by the ball on the right in Figure 2. The only difference between these two balls is the pin buffer. 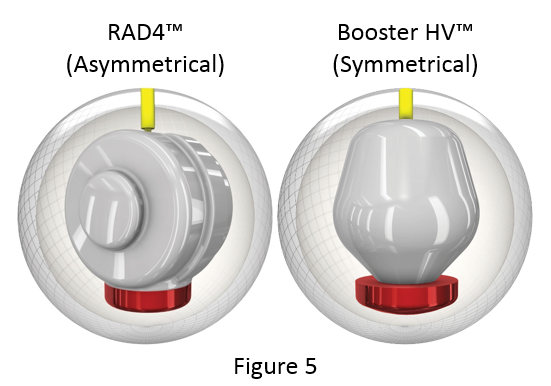 The ball on the left has a 2" pin buffer, while the ball on the right has a 4 1/2" pin buffer. You can see that the pin is forced further down the farther away it gets from the VAL and further up when it is closer to the VAL. Now that we understand what is causing the difference in the layout, let's take a look at some of the key differences in dynamics that result from putting the pin above the fingers compared to below. 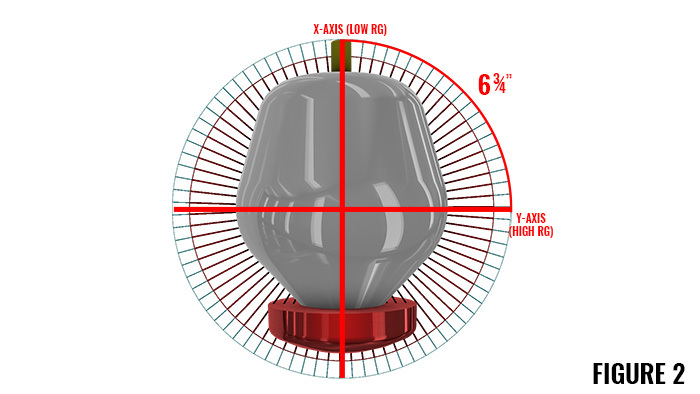 When drilling a bowling ball in today’s game, it is important to note where the mass is being taken out of the core. Every hole you introduce to the ball is going to alter the shape of the core. This means the RG and differential are both going to change from the undrilled number. Refresh your mind by looking at Figure 3. 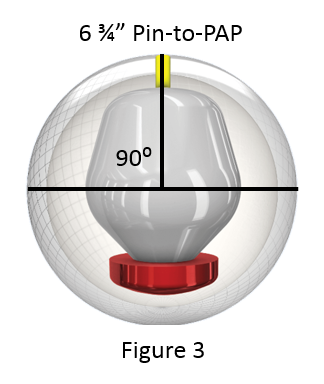 As we know, the pin is the designation for the x-axis on the surface of the ball. It is the very top of the core. Approximately 6 3/4" away from the x-axis is the y-axis. This is 1/4 of the ball and gets us directly into the side of the core. Total differential is measured as the difference between the x-axis and the y-axis. Essentially it is a measure of the difference between the height and width of the core. The larger the difference, the higher the total differential. More differential means that there is the possibility for more imbalance and flare if the core is positioned appropriately from the PAP. Getting back to the topic of this article, let’s take a look at how we change these core dynamics with pin up and pin down layouts. Take a look at the example that we have shown in Figure 4. It's a basic example, but you'll notice the pin is above the fingers. This is going to result in the holes being drilled more to the side of the core. This means that more mass is going to be taken out of the side of the weight block than the top. This is essentially making the weight block thinner than it was originally. The larger the hole, the more influence it is going to have. You'll notice on most pin up layouts, the thumb hole ends up being close to 6 3/4" away from the x-axis. As you can see, this increases the difference from the x-axis to the y-axis. This raises the total differential and keeps the RG lower than it would be if the holes were in the top of the weight block. We know a lower RG ball is going to transition faster because it is less resistant to changing direction. Think of an ice skater with their arms in. They spin extremely fast because a majority of the mass is located towards the center. This is going to result in the ball revving up faster and flaring more. Overall, this will make the ball stronger and transition faster off the spot. Take a look at the example that we have shown in Figure 5. A pin down layout is going to result in the holes being drilled more on the top of the core. This means more mass is going to be taken out of the top of the weight block than the side. This is essentially making the weight block shorter than it was originally. You can see how you are now moving the thumb hole away from the y-axis and drilling the fingers nearly on top of the x-axis. As you can see this decreases the difference from the x-axis to the y-axis. This lowers the differential and raises the RG. We know a higher RG ball is going to transition slower because it is more resistant to changing direction. Think back to the ice skater. If they put their arms out, more mass is away from their center. This makes them slow down and requires more energy to be added in order for them to spin at the same rate as they did with their arms in. This is going to result in the ball revving up slower and flaring less. Overall, this will make the ball weaker and transition slower off the spot. The days of a pin up ball going farther down the lane and a pin down ball starting sooner are gone if we hold the other variables constant. 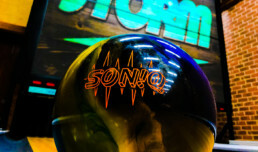 The changes in bowling ball technology over the years have significantly altered how drilling the bowling ball will influence ball reaction. These large dynamic shapes now dominate ball reaction and overpower static weights. Modeling these two different layouts on our engineering software, we were able to change the differential a significant amount. 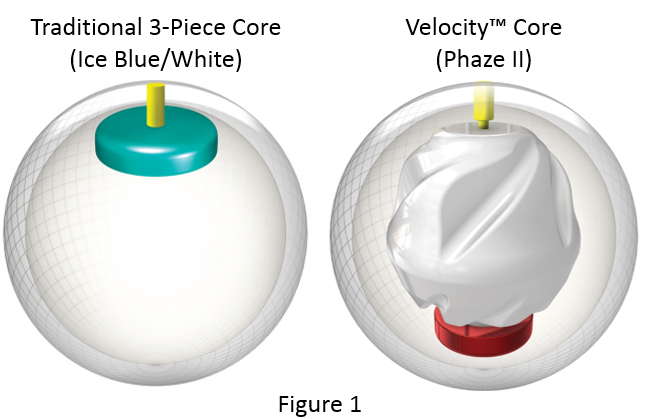 Prior to drilling, a 15lb Velocity Core has a differential of 0.051. When we modeled the pin up layout, the differential went up to approximately 0.057. When we modeled the pin down layout, the differential went down to approximately 0.035. As you can see, where the mass is taken out of the weight block and how large the holes are makes a tremendous difference on the specs of the core. The main idea of this article is to get you thinking about the cause and effect of drilling a ball in today’s game. Every hole you introduce to a ball is going to alter the shape. Are you altering the shape in a way that matches up to how you throw the ball or what you bowl on? Again, we know that there are many more pieces to this puzzle. All we can do is take a look at each of the pieces one at a time to fit them all together to see the entire picture.